“I had a vision to put us all back together,” raps T-3 on “The Reunion Pt. 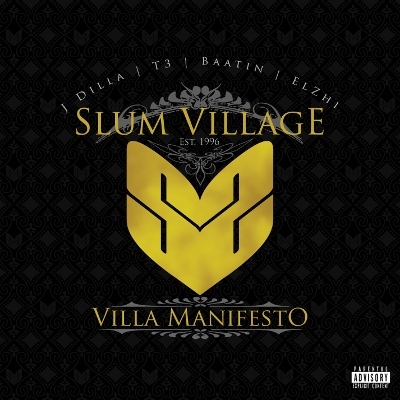 2” from Slum Village’s Villa Manifesto. But much has changed since the group’s 2005 self-titled album: J Dilla passed away in 2006, and then Baatin died from a drug overdose three years later. Both get the spotlight through pre-recorded material, and when the quartet shines together on the kinetic “Earl Flynn,” it’s Fantastic all over again. Wisely, surviving members T-3 and Elzhi balance bittersweet memories (“We’ll Show You”) with the sumptuous neo-soul raps SV fans know and love them for. This entry was posted in Reviews, Short Cuts and tagged E1 Music, Rhapsody, Slum Village. Bookmark the permalink.